Many modern satellite and cable receivers offer the ability to record television and radio programs by a so called PVR function. 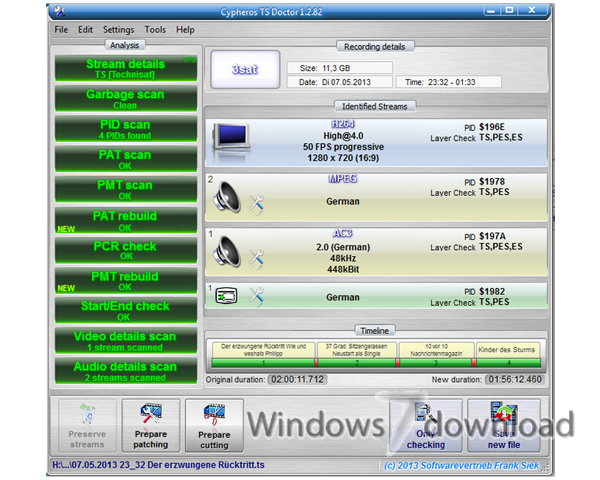 Such recordings are stored usually in the transport stream format (ts) or in a kindred format. Unfortunately, such recordings often contain errors or incompatibilities that lead to incompatible recordings that can't be played back on other devices without problems. 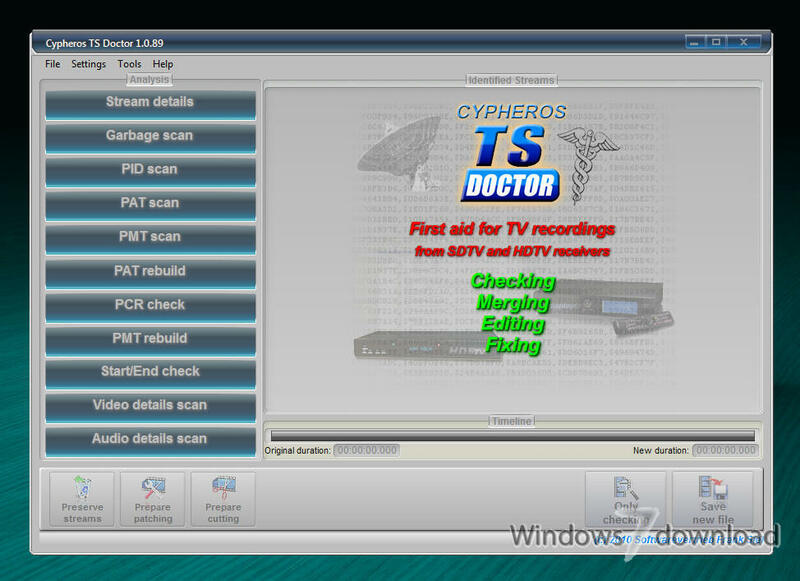 Here, the TS-Doctor can help more than any other tool, for both SDTV and HDTV recordings. It verifies the recordings for errors, adapts the format to eliminate compatibility issues and cleaned up the recordings without changing the actual video and audio data. In the end you will get a compatible transport stream (ts), that can be played easily on the computers or hardware media players such as popcornhour a100/110/c200, wdtv, xtream and many other similar devices. * Support for Kathrein HD TRP streams! * Correction of wrong video_full_range_flags (colorspace) in DVB streams! * Visual cutting function for the begining and the end of the stream! 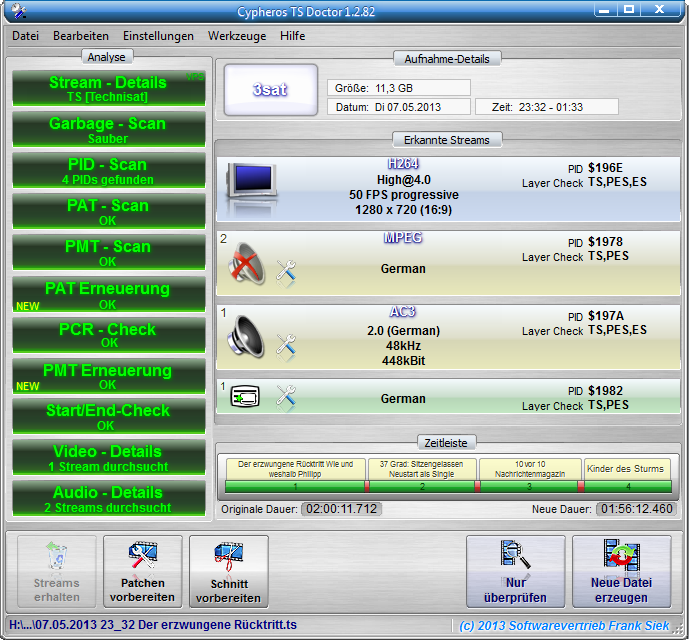 * Support for iCord HD M2TS and Technisat TS4 streams! * Support for Comag SL 100 HD DVR streams! 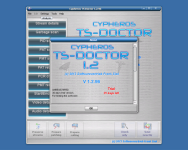 All Cypheros TS-Doctor reviews, submitted ratings and written comments become the sole property of Windows 7 download. You acknowledge that you, not windows7download, are responsible for the contents of your submission. However, windows7download reserves the right to remove or refuse to post any submission for any reason. 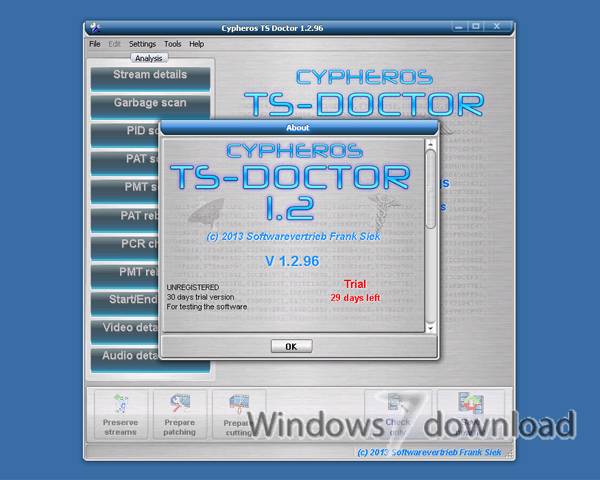 Windows 7 Download periodically updates pricing and software information of Cypheros TS-Doctor full version from the publisher, but some information may be out-of-date. You should confirm all information. Using warez version, crack, warez passwords, patches, serial numbers, registration codes, key generator, pirate key, keymaker or keygen for Cypheros TS-Doctor license key is illegal and prevent future development of Cypheros TS-Doctor. Download links are directly from our mirrors or publisher's website, Cypheros TS-Doctor torrent or shared files from free file sharing and free upload services, including Rapidshare, MegaUpload, YouSendIt, SendSpace, DepositFiles, DivShare, HellShare, HotFile, FileServe or MediaFire, are not used.